Heat oven to 350°F (325°F for dark or nonstick pan). Grease or lightly spray bottom only of 13x9-inch pan. Add enough water to drink mix to measure 1 1/4 cups. In large bowl, beat cake mix, drink mix, oil and egg whites with electric mixer on low speed 2 minutes. Pour into pan. Bake and cool and directed on box for 13x9-inch pan. 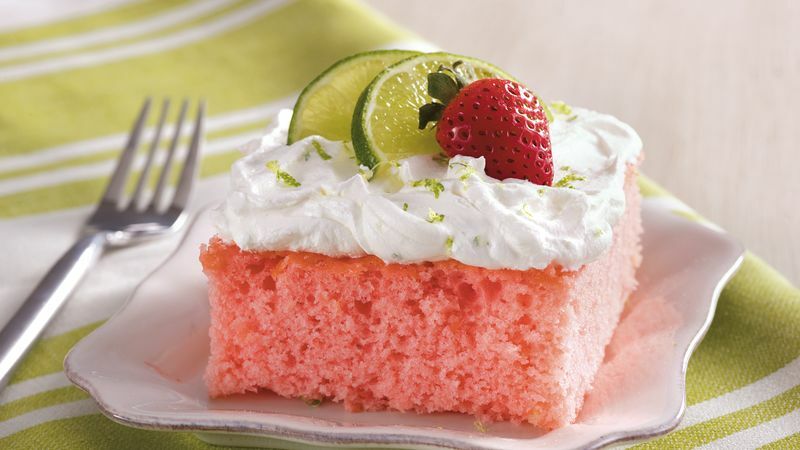 Gently stir lime peel into whipped topping; spread over top of cake. Garnish with strawberries. Store covered in refrigerator. Chocolate frozen whipped topping also makes a great frosting for this dreamy cake. Stir orange peel instead of lime into the chocolate topping. Before grating the lime peel, wash the lime thoroughly and wipe dry. The peel will grate much easier.